Have you already been training Krav Maga for a while or lots of years of Martial Arts experiences and now you are ready to undertake a responsible task and share your knowledge with others? We want YOU as an instructor then! 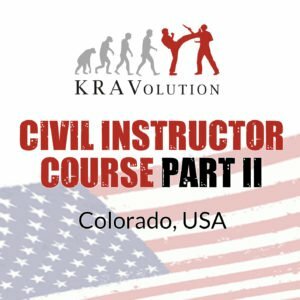 We´ll support you with all our know-how at the KRAVolution Civil Instructor Course! 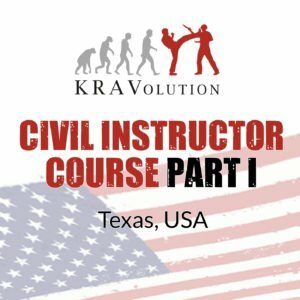 If you want to become a Krav Maga Instructor, sign up now and train with the KRAVolution instructor team. The goal of our Krav Maga course, which is one of the most complete and most extensive ones in the whole system, is the deployment of qualified instructors in our instructor team as well as the deployment as Civil Krav Maga Instructor internationally. That´s why the course is held by the Krav Maga instructor team. To make you the best instructor out there, we deploy the best instructors out there! The Course will be conducted in English. We set new standards with our new concept for the Krav Maga instructor training and want to think out of the box. That´s why we revolutionized the former training. We won´t lie. It´s a hard way from a participant to an instructor and by that to a Krav Maga blackbelt – earned not given. But, if you can make it, you´ll belong to the best educated Krav Maga instructors all over the world.